United States, 1 February 2019 -- The global smart thermostat market has witnessed a robust growth over the past few years. This can be attributed to the increasing adoption of connected devices along with the various advantages offered by smart thermostats. 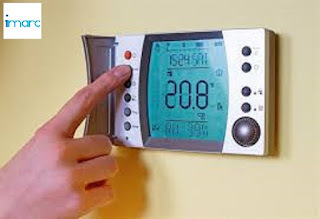 The latest report by IMARC Group, titled “Smart Thermostat Market: Global Industry Trends, Share, Size, Growth, Opportunity and Forecast 2018-2023”, finds that the global smart thermostat market reached a value of US$ 1.1 Billion in 2017. Smart thermostats allow users to control the heating and air conditioning of their homes or offices via the internet. These devices collect data related to the behaviour and specific needs of the user and adjust themselves accordingly. Smart thermostats can also be used with home automation systems to offer customized settings which minimize energy use while maximizing comfort. Some of the other advantages offered by smart thermostats include recording the runtime of HVAC systems, monitoring internal/external temperatures as well as improving indoor air quality. Owing to the convenience provided by smart thermostats, the demand for these devices is being accelerated worldwide. • Based on product, the market has been segmented as standalone smart thermostats, connected smart thermostats and learning smart thermostats. Amongst these, standalone smart thermostats are the most widely used products owing to their cost-efficiency. • On the basis of component, temperature sensor represents the leading segment, accounting for the majority of the global share. Other components include display, humidity sensor and motion sensor. • The market has been segregated based on technology into wired and wireless smart thermostats. Currently, wireless smart thermostat dominates the market, holding the biggest market share. The wireless smart thermostat segment is further divided into Wi-Fi, Zig Bee and others. • On the basis of application, the report finds that the residential sector is the largest segment, followed by the commercial and industrial sectors. • Region-wise, the market has been segmented into North America, Asia Pacific, Europe, Middle East and Africa, and Latin America. Amongst these, North America is the leading market for smart thermostats. • The competitive landscape of the market has also been examined with some of the key players being Control4 Corporation, Nest Labs, Inc., Emerson Electric Co., Honeywell International Inc., Ecobee, Inc., Schneider Electric SE, Tado GmbH and Nortek, Inc.